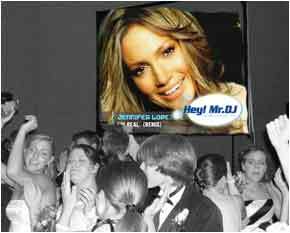 Your school dances can be taken into the next millennium with our HUGE 15-foot video screen! The latest addition to our school dance packages is our giant video screen. The screen plays the latest and greatest MTV-style music videos, along with favorite party classics you may have never seen before! We can also put the students on the screen and make them the stars of the show with our Crowd Cam! This works exceptionally well at formals where you may be crowning a King and Queen (or similar) and want everyone to get an up-close view of the crowning and ceremony. Our video screen has limited availability and is booked on a first-come, first-served basis, so be sure to ask about adding it to your next Hey! Mr. DJ school event! The screen can also be used for pep rallies, full-school presentations, or for lock-in events to put TV, movies, or video games on the big screen.